German or Swiss? Landsknecht or Reisläufer? Until 1490 the Swiss were the superior warriors of Europe, and Swiss instructors was imported to tech German soldiers how to fight, forming a new group of mercenaries in Europe, the Landsknechts. The Landsknechts also copy the Swiss outfit and even added more slashes and flamboyant look to it. The Landsknecht copying the Swiss fighting style and fashion wasn’t that popular among the Reisläufers and the lesser employment opportunities with a growing group of Landsknechts, made the two groups bitter rivals and enemies, especially since the Landsknecht didn’t care for who they fought for …as long as they were payed. 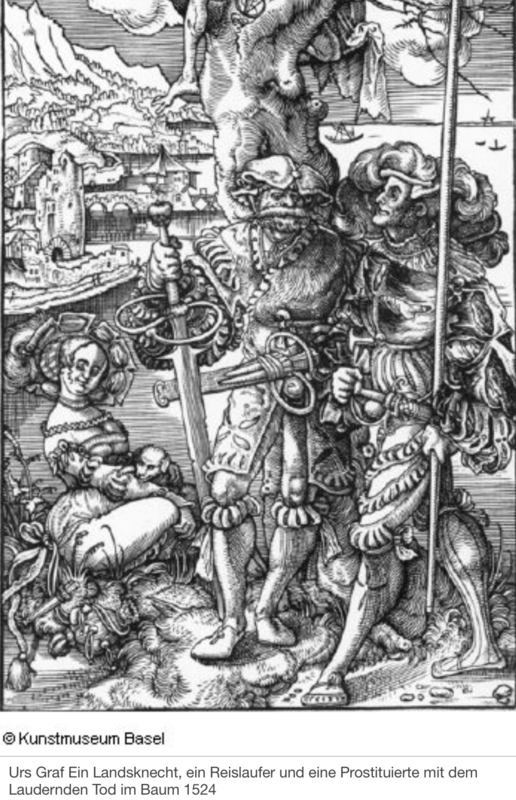 The woodcut below shows a rare view of a Landsknecht and a Reisläufer in the same woodcut, a symbol of a truce between the two groups during this period of wars raging back and forth through Europe. The Landsknecht on the left has the distinct x slashing on his leg popularly interpret as the representing the cross of Saint Andrew and the Holy Roman Empire (Osprey). The Reisläufer’s chest and sleeve has a + slashing representing the Swiss Confederation. Some artist painted several different kind of mercenaries, but most of them have their favorite kind of mercenary; Urs Graf (Swiss citizen and served as a mercenary during his lifetime) is more likely to paint Reisläufers rather then Landsknechts. The Katzbalger was seen as the symbol for a Landsknecht. Katzbalger is the short sword seen of the left mercenary above. This entry was posted in Landsknecht, Trossfrau and tagged 16th century germany, german mercenary, Landsknecht, Reisläufer, slashing, swiss mercenary.